It’s the Semi Co-op summer special! The next three weeks will be a little different. 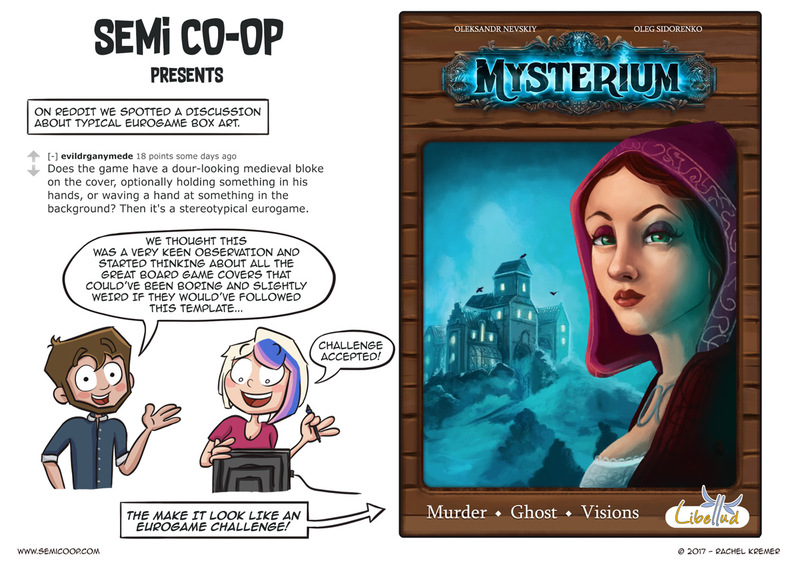 Rachel reimagined three board game covers using the rule of the archetypical Eurogame box art rules. This all started when we came across this Reddit thread:”What is the most “eurogame” eurogame in your opinion?“. Eurogames or German-style games are games with low luck and low player conflict. Victory is, most of the time, achieved through gathering the most resources or point and not through direct combat. Think of games like Agricola or Catan, it’s all about building an engine that provides you with the right resource to grow the fastest. Games with a lot of dice rolling for shooting each other and random events tend to be called Ameritrash because this type of design used to be more prevalent in the U.S than in Europe. Think of games like Risk and Eldritch horror where winning can be decided by getting lucky on dice rolls. An interesting historical reason for this difference in game design was the aversion against products that glorified violence in post-war Germany which resulted in the popularity of economic games. Because of the lack of explosions and big monsters in these games, the themes used to be things like trading in the Mediterranean (there is even a Dice Tower top 10 about this specific theme!) and the box art used to be kinda bland. Luckily these two schools of game design have come together these past years creating new hybrid designs like Gloomhaven or Above and Below. Mixing the exciting themes and stories with solid designs that are powered by player decisions and not just random luck. This is great because we love some thematic flavor in our Engine builders and some strategic options in our dice filled luck-fests. Enough of the board game history lesson! We’re off having adventures in the real world, we hope you have a great summer with some great games! What do you think is the most boring board game box art ever? Haha this is totally brilliant. Nice! My first thought was, Concordia. Also fullfilling all the criteria of the reddit post. It’s an euro game with a bit more player interaction than is normal in the genre. Luckily that game is much more fun to play than too look at. Luckily the second edition box is a huge improvement over the first edition I have. FOR THE HOLE .. KLASK! The most bland boardgame box I know of has to be Arrondissement. It’s almost like the cover art was an afterthought in this game. The logo is still too exciting.